Dozens of hardboard plants operate across North America. They turn pulpwood logs into essential products used by millions of Americans every day. In the Twin Ports, two such plants competed with each other for their share of the once-booming hardboard business: Duluth’s Superwood Corporation and Superior Fiber Products in Superior. While Superwood excelled at creating hardboard known for its structural performance used in the automotive industry, Superior Fiber Products made a smoother finish hardboard sheet ideal for creating ready-to-assemble furniture. With vast and renewable forests so close to Duluth and Superior, it made perfect sense to build and operate hardboard factories here. 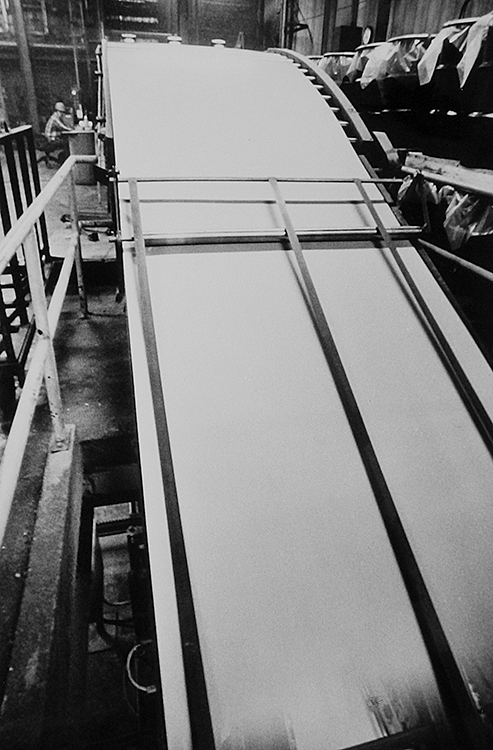 First produced by the Masonite Corporation in 1926, hardboard is a generic term for a panel manufactured primarily from wood fibers and resins consolidated under heat and pressure in a hot press and formed into a long sheet that is typically cut into shorter 4×8-foot finished sections. One of its most popular early applications was pegboard, used everywhere from factories and retail stores to home workshops and garages—it was indispensable in allowing shops and stores to become more organized. Paneling made of hardboard lined dens and basement rec rooms in American homes for decades. Due to its versatility, the automotive industry uses hardboard to create dashboards, head liners, interior door panels, and spare tire covers. You’ll find it virtually everywhere being used for product displays, signs, garage door panels, jigsaw puzzles, toys, wagons, and blackboards. (If you’re old enough, you probably remember the perforated hardboard back panels on radios and TV sets.) Perhaps the most recognizable use of hardboard today is in ready-to-assemble home and office furniture. In May 1945 Lloyd Johnson and Don McDonald founded Superior Wood Products to make furniture. 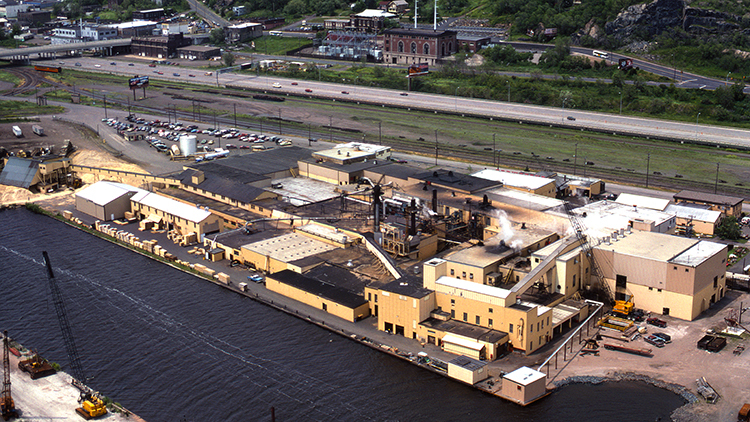 In the late 1940s the company built a mill at the elbow of Duluth’s harbor front and Rice’s Point, the plant was bordered by Railroad Street, Harbor Slip C, and 12th Ave. West—the former site of Zenith Dredge Company’s Ship Building Division where 30 steel-hulled Navy ships and tankers were constructed during the second world war. The company changed its name to Superwood in 1954 when it shifted from furniture to hardboard. The Duluth plant started with a single forming line. Over the decades the plant expanded one section at a time, creating a rather hodge-podge look to the overall complex. More production lines were added until the plant had five in total, four in constant use, with the No. 1 line shut down. Of the four operational lines, the No. 3 and No. 5 lines produced most of the volume. The No. 5 line, which was the newest and largest, produced fully 50 percent of the plant’s capacity. The Duluth plant was capable of making board as thin as 1/10th of an inch to as thick as 3/16ths of an inch. While the majority of these early hardboard products began as simple, flat shapes, new techniques were developed during the 1960s to make possible forming the board into different shapes. After that, about 40 percent of the plant’s production became dedicated to making parts for automotive fabricators who supplied fully finished and formed hardboard parts to Detroit’s auto makers. Ford actually bought the first hardboard for automotive use during the 1950s and used it for the interior door panels for their Fairlane sedans. Ford and General Motors always used a large percentage of Superwood’s production capabilities. At Superwood more than 80 percent of the raw material (Aspen logs) arrived pre-chipped in trucks. The other 20 percent arrived either in trucks or in railroad cars as logs that needed to be chipped. Superwood’s property was served by two railroads, Chicago & North Western (formerly the Omaha Road) and Burlington Northern (formerly Northern Pacific) on four surface tracks. Three tracks were located at the southern end of the complex. Two of them went inside the building for boxcar loading and the third was an outside track for unloading pulpwood flats. Pulpwood was stored on the ground here prior to chipping. A fourth track ran into the property from the northern end. Trucks unloaded their chips and logs at the southern end of the property. The chips could be direct loaded into the facility via a hydraulic truck dumper and conveyor system. Environmental concerns about industrial pollution of the ground and waterways are now omnipresent. It wasn’t always that way. During the early 1980s Superwood’s operations were inspected. The results revealed a concern that actually created a business within a business. A new process was developed to extract molasses from factory waste water. This process solved the environmental concern and also created an entirely new revenue stream for Superwood. The new molasses business brought in an extra $100,000 annually. The former boxcar loading track on the north end of the property was converted into a molasses loading track. Empty tank cars were spotted here, then loaded with molasses that was sold and shipped to Cargill for use in cattle feed. Across the bay in 1964, Superior Fiber Products built a new manufacturing facility with one high-volume production line. Superior Fiber was a subsidiary of Permaneer Corporation, founded by Allen Portnoy in 1960. Permaneer made doors, paneling, furniture, and other wood products. Superior Fiber Products manufactured high-density hardboard paneling from debarked Aspen logs known locally as round wood. About 150 cords per day were debarked, chipped, ground and digested into the manufacturing process. The final product was a smooth, one-sided hardboard panel. A quarter of their sheet production had a painted or printed top coat, and 80 percent of production was cut to exact specifications mainly for the ready-to-assemble furniture market. The plant was located on Connors Point in Superior just east of the ex-Peavey/Continental Grain elevators, now owned by Gavilon Grain LLC. The property had a single track served by the Lake Superior Terminal & Transfer Railway. Superwood bought out Superior Fiber Products in 1985. The combined companies were then acquired by Georgia-Pacific (G-P) in 1986, but continued to operate under their pre-merger names until their eventual closings due to downturns in the wood products industry. The first closure affected 117 employees when Superior Fiber Products was shuttered in 2001; 117 employees lost their jobs. Elkhorn Industries purchased the facility in 2003 for industrial storage, manufacturing, and warehouse floor space facility. In 2006 Elkhorn experimented briefly with the idea of reopening the hardboard line using an environmentally friendly closed-loop system to power the machinery and provide the steam used in pressing the hardboard. G-P, formerly a publicly traded corporation, was taken private in a December 2005 purchase by Koch Industries. Superwood closed in August 2012, sending 141 more employees to look for work. The last 20 Superwood employees stayed on until mid-October that year, ending 67 years of successful hardboard production at the Head of the Lakes.